Advocacy made 2018 a historically successful year for affordable housing and efforts to end homelessness. So, what's next? Join special guest Representative Nicole Macri (LD 43) to hear about this year's legislative wins, and how you can get involved in our Listening Sessions that will shape the Housing Alliance’s 2019 legislative agenda. The game has changed (for the better!) when it comes to protecting tenants and expanding resources for services that prevent and end homelessness in Washington. Join Director of Policy and Advocacy Michele Thomas and Resident Action Project leader Mindy Woods for a deep dive into the new, permanent statewide funding source for homelessness, and the new law banning source of income discrimination. The National Low Income Housing Coalition’s Senior Policy Analyst Elayne Weiss talks about how we went from proposed slashes to increased federal investments in affordable housing, and what to expect in 2019. Also learn more about how to get involved in the “Our Homes Our Voices” week of action! An update on the implementation of the Foundational Community Supports Medicaid benefit that is part of Washington's Medicaid Transformation Demonstration (formerly known as the supportive housing services and supported employment services Medicaid benefits). Guest speakers include staff from the Washington State Health Care Authority, the Department of Social and Health Services, and Amerigroup Washington. Advocacy expert Nancy Amidei compares advocacy to your favorite Jazzercise routine; you can never get enough practice and there is always a higher level to make you sweat! Nancy will get us warmed up for the 2018 legislative session with tips on key advocacy tactics like calling the Legislative Hotline, meeting with lawmakers, and delivering testimony on a bill. Bring your own sweatbands and water bottles! Participants are encouraged to watch a recording of the October 18 webinar titled, “The 2018 Legislative Agenda and Political Landscape,” before joining this webinar. (link will be available Oct 19). The Housing Alliance is working to pass a comprehensive set of policies to expand access to affordable homes and reduce homelessness during the 2018 state legislative session. Join this webinar to learn how to craft a persuasive advocacy message and communicate effectively with lawmakers in order to pass these priorities. Communication is a key part of advocacy, and this training will cover common pitfalls to avoid and communication tips that you can use in your legislative advocacy. Housing Alliance Policy and Advocacy Director Michele Thomas reviews vital affordable housing and homelessness policy and budget priorities in the 2018 legislative session, and how our strategy to advance these priorities will be shaped by the results of the November 2017 General Election. For a refresher on our policy priorities from last year, check out this webinar. Understanding the history, goals, and details of Seattle's Fair Chance Housing Ordinance, including ammendments and progress as of Aug 9. 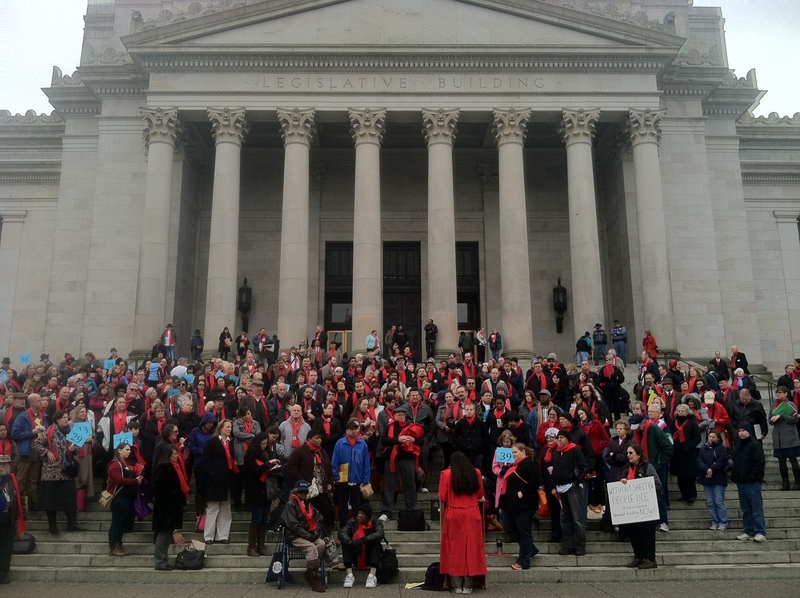 Dimitiri and Michele review the awesome advocacy work from the regular legislative sessioin, give an overview where housing and homelessness priorities are in Olympia, and tell you how to be the most effective advocate during special session(s). Kate explains strategies for advocating effectively with elected officials at the state level, whether those officials agree or disagree with you on any given issue. March 8 is the deadline for bills to be voted out of their house of origin, AKA cutoff. Join Michele after cutoff for a rundown of which housing and homelessness bills are dead, which are still alive, and what to expect for the remainder of the legislative session. Join us to learn more about threats to federal affordable housing programs and how you can help protect these critical resources. Sarah and Joey from the National Low Income Housing Coalition will give an update on where things stand in Congress and how you can make a difference. As lawmakers debate how to adequately invest in schools, what are the options that support not just schools but housing, clean air, and all the foundations of a thriving state? Kelli Smith and Sumayyah Waheed from the Washington State Budget & Policy Center will share proposals to clean up the tax code so that we have more resources to invest in all Washington communities. Join Kate for an inside look at how our budget and policy priorities advance through the legislative process. Learn why we take action when we do, and how to take advantage of the tools on the state legislature’s website to track bill progress and more. The Housing Alliance's top advocacy priorities for 2017 include expanding the Housing Trust Fund, protecting and expanding homelessness funding, and protecting tenants from source of income discrimination. As board members, we have the power and the responsibility to address need, and implement smart solutions in our communities. Join us to understand the impacts of statewide policy and learn how to use the political narrative to strengthen your advocacy and build a movement. This session is developed with board advocacy in mind, but advocates from all backgrounds are welcome and encouraged to participate. After a few solid weeks to decompress from a high-stakes election season, we will provide an analysis of the 2017 state-level election outcomes and what they mean for the paths forward on our priority policies in the legislature. Join us for an overview of our 2017 lead agenda, where we will review policy priorities for the upcoming legislative session - including plenty of useful background info and tips on how you can be an effective advocate for housing and homelessness policies. Learn how to use our Toolkit, articulate the harm that criminalization policies cause, and educate lawmakers on the alternatives. Many affordable housing and homelessness issues can arise during the legislative session, and the interim period between sessions (right now) is a perfect time to give legislators the background they need to make smart policy decisions next year. On this webinar, we will provide an overview of the Document Recording Fees and the Housing Trust Fund, break down the critical roles they play in ensuring adequate funding for affordable housing and homelessness services, and offer ways for you to educate your lawmakers. One of our hard-fought victories this past legislative session, the passage of Senate Bill 6413 by Senator Mark Mullet, creates groundbreaking new opportunities for tenants to remove unfair eviction records from their tenant screening reports. This opens up housing opportunities for many tenants currently being denied housing due to eviction records, including those who have won in court. Join this webinar to learn more about the accomplishment and how tenants and service providers can utilize the “limited dissemination” option to remove or prevent certain evictions from being included in reports. Earlier this year, powerful advocacy led to the passage of HB 2263, giving communites a new option to put a local sales tax on the ballot as a wat to fund affordable housing and mental health facilities and services. Find out how it works, and what it means for your community. Plus, get a preview of our 2016 legislative agenda! The legislative session is over, and that means we get to change up the pace and take a little bit more time with legislators. Affordable housing and homelessness issues can be complex, and the interim period between legislative sessions is a perfect time to give legislators the background they need in order to understand how best to help ensure that everyone in our state can have the opportunity to live in a safe, healthy, affordable home that is part of a thriving community. The 2015 Legislative Session was an exciting time for our state’s efforts to address youth and young adult homelessness. There’s a lot to talk about! These passed: Homeless Youth Act, Extended Foster Care, and the Youth Equality & Reintegration (YEAR) Act. And these are still in play: the Washington Youth & Families Fund and the Homeless Student Stability Act. Join folks from the Washington State Department of Commerce and the Washington Coalition for Homeless Youth Advocacy for a webinar that will bring you up to speed with what happened so far, what’s likely to happen next, and what we can do to build on these victories. Wondering what the heck happened during the regular session? Wondering what the scoop is on what still needs to get done? This webinar was a debrief and review of the highlights from the 2015 regular legislative session. Hear what bills made it to become laws, what bills died along the way, and how we can prepare to influence the next steps in legislative process. This webinar, presented in collaboration with the Department of Commerce, the Governor’s Affordable Housing Advisory Board, and the Washington State Housing Finance Commission, will explore exactly what is in the report and what the findings mean for our efforts to ensure that everyone in Washington has the opportunity to live in a safe, healthy, affordable home. Firesteel and the Seattle University Project on Family Homelessness joined up with us to for this free training session for individuals who want to learn the basics of social media and use these tools to advocate online for affordable housing issues. The session will help you understand and use social media sites and apps like Twitter and Facebook and show you how to join with organizations to be an online housing advocate. Our 2015 lead policy agenda. Latest updates on committee assignments, bill sponsorships, and the budget. Talking points for each of our agenda items. Our community organizing and policy teams got together for this Learn at Lunch webinar about the different ways you can engage in advocacy this session, (Housing and Homelessness Advocacy day, testifying in Olympia, action alerts, and more). Discover all the helpful resources we offer to help you become a super-advocate rockstars, such as issue one-pagers, talking point lists, and policy updates. This is a high-level, deep-dive into our state legislative work for this session. A deep-dive into the three major pieces of tenant legislation on our 2015 advocacy agenda: the Fair Tenant Screening Act, the Truth in Evictions Reporting Act, and Protection from Source of Income Discrimination. Northwest Justice Project Staff Attorney Eric Dunn will be joining the webinar to walk attendees through what actually happens to tenants in eviction court and how these legislative proposals could improve those outcomes. Over the past 25 years, Washington State's capital investments in affordable housing (made through the Housing Trust Fund) have played a central role in efforts to ensure that everyone has a safe, healthy, affordable home in a thriving community. Join Housing Alliance's Michele Thomas and Ben Miksch and special guest Representative June Robinson to hear about how the projected $4.5 billion state budget shortfall might negatively impact investments in affordable homes. We'll also talk about what advocates like you can do to help. This webinar features Housing Alliance all-stars Director of Policy & Advocacy Michele Thomas, Lobbyist Nick Federici, and Field Director Brianna Thomas. They will provide a recap of what happened in the recent election, the political and budget landscapes, and an introduction to the Housing Alliance's 2015 Housing & Homelessness Legislative Agenda. Note: Due to technical difficulties, the first third of the webinar is missing. We apologize for this inconvenience.